Current energy consumption in cities around the world is damaging the environment by compulsively releasing CO2 into the atmosphere at an alarming rate. In addition to threatening the biosphere, populated areas are at constant risk of power outages as their power grids are often forced to operate at up to 800% design capacity. One company making strides in bringing light to these dark conditions is Lucedentro. The Sassuollo, Italy based business Lucedentro has been developing a diverse range of innovative applications for photo-luminescence. The science of photo-luminescence has found the ability to collect solar and even artificial light, store that energy, and harness it to provide illumination through a myriad of useful and beautiful applications. The luminescent pigments employed in their process are so malleable for manipulation, that nearly any material can be enhanced by photo-luminescence. Photo-luminescence provides an entirely new arena for the aesthetic quality of design for lamps, glass, mosaics, and ceramics. Further, the logistical possibilities when using this technology in resins, silicones, cement, textiles, and metals, are vast and inspiring. Enhancing living environments with photo-luminescence is a safe, cost effective, and ecologically responsible answer to lighting in both public and private spaces. At night decorative fixtures can guide private residents safely through their homes and properties without the cost or hassle of traditional lighting systems. The same technology makes neighborhood streets and town thoroughfares safer by lighting traffic signs and lining pedestrian walkways. Using photo-luminescent products can reduce a population’s electrical consumption by up to 90%. The natural materials used in the production cycle of photo-luminescent products, also maintain a low environmental impact. These simple facts make photo-luminescence innovation a leading technology in moving towards an eco-sustainable society. 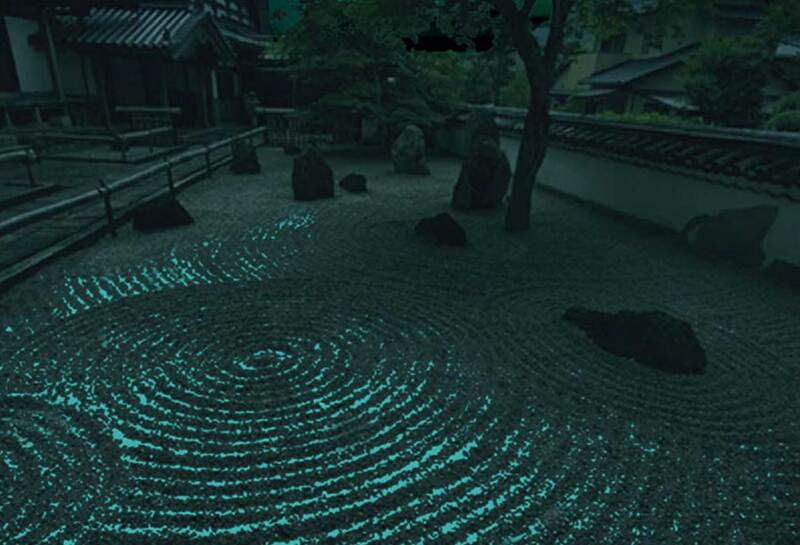 Photoluminescent Zen Garden There are few works of elegant beauty that approach the perfection of a zen garden of pure photo luminescent light. 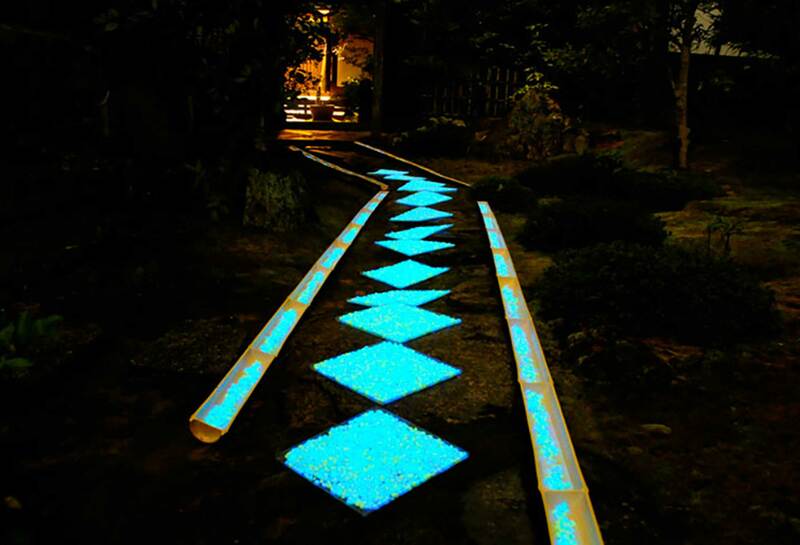 This path combines form and function in luminescent art. Simple works such as this enhance environments and the lives traveling such paths. 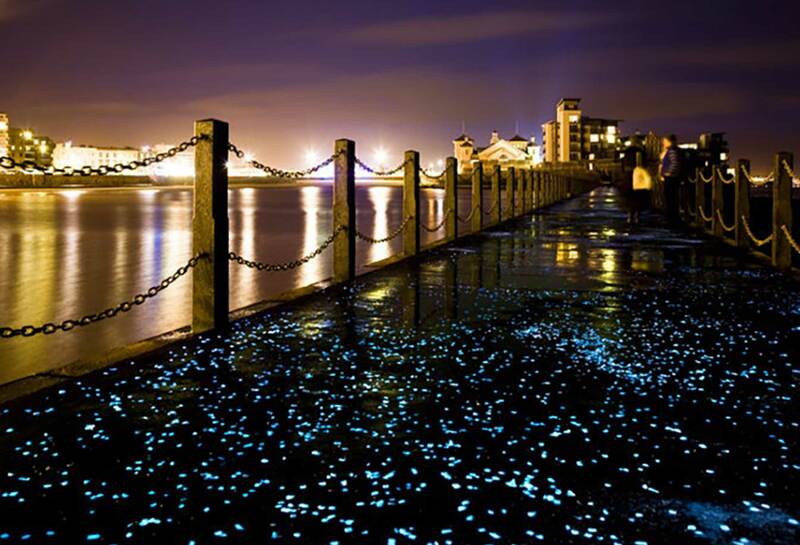 Weston Super Mare Walkway Lucedentro created a constellation causeway placing the majesty of the night sky underfoot in a photo luminescent path dividing the artificial marine lake from the expanse of the adjoining sea. 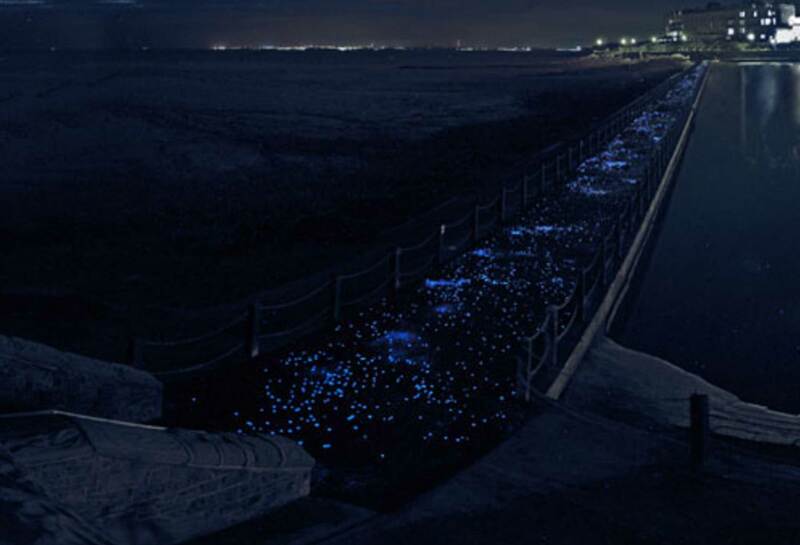 This brilliant design brings the two most awe inspiring expanses in nature together in a celebration of the night sky meeting the ocean on a magical path that mimics the horizon.